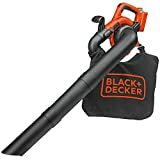 The BLACK+DECKER Bare 36V Lithium Ion Sweeper/Vac is an efficient cordless sweeping tool for clearing driveways, sidewalks, decks, garages and other hard surfaces of leaves, grass clippings and other lawn debris. It easily converts to vacuum mode for quick and easy vacuuming of debris from hard surfaces like patios, decks, garages and walkways. Not recommended for use in the grass or flower beds. This is a bare-tool item that works with the powerful 36V Lithium Ion battery or the 40V MAX* Lithium Ion battery for easy use without extension cords (battery and charger not included). This item features Power Command which controls speed for maximum run-time or maximum power . This is a lightweight unit at just 5.4 pounds for quick and easy blowing of debris; 6.9 pounds in vacuum mode. Its low noise design allows for quiet operation, so not to bother the neighbors when in use. 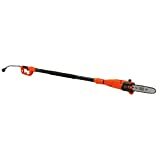 It also features a blow tube with built-in scraper which allows user to loosen matted leaves and stuck on debris. Soft grip handle provides added comfort during use. The BLACK+DECKER BDCMTRS Matrix Reciprocating Saw Attachment is designed be used with any tool in the BLACK+DECKER Matrix line including the BDEDMT and BDCDMT112. It features the Quick-Clamp tool free blade mechanism for fast & easy blade changes. The compact design is specially built for one-handed operation and access in tight spaces. It allows for multiple grip positions for a more comfortable grip and maximum control. The ability to pivot provides stability and continuous contact while adjusting leverage throughout cut. This is a perfect addition to your collection of Matrix tools and attachments – designed for light demolition, cutting scrap wood, cutting nails & fasteners and trimming branches.